Jobs are obsolete. Careers have ended. Yet I have a solution; indulge me. Sound familiar? I bet it does. THE other “N-word”, NETWORKING. Flocking to the possibility some were perplexed to hear more business opportunities, than how to snag that interview. Politely, heads nodded; smiles etched painfully: disappointed, the pattern resumed endlessly…THE OLD FASHIONED WAY! What if we changed our focus? What if we engaged in a shift where the unemployed and underemployed pooled their talent, treasury and time to develop, purchase and manage businesses? Can you imagine the economic leverage?! Synergy always engenders abundance. Business development will ALWAYS profit those who invest and invent. I was listening to a popular activist show on urban radio Sunday morning that caters to the issues and concerns of the so called Black community. A female caller suggested that marching and protesting was nonsensical it its approach to tackling injustices; most specifically the police shooting death of an unarmed Kimani Gray. When this woman suggested that “we” use that time and mobilization to purchase our own schools, own land, and own community – she was shot down and shut out. The men on this show became very defensive; offended by the fact that someone dare challenge a methodology of attacking wrongdoing that seemingly falls on deaf ears; in a word deemed ineffective. Oh it doesn’t stop here. A few years ago at the State of Black America conference hosted by Tavis Smiley, Minister Louis Farrakhan (Part 1) (Part 2) challenged the so called Black community to cease begging an oppressor to support causes of Black people, and for Black people to pool resources to take care of “our” own issues; especially challenging Black megapreachers to come together with all their money, planes, and cars to do so. The host pastor, Eddie Long never looked “tighter” as he slouched in his chair , later catching heat from his congregation for being told to do things for themselves, collectively (Ujima). Heaven forbid. Dr. Claud Anderson of Powernomics has a highly effective economic plan that could catapult the so called Black community out of economic dependency. 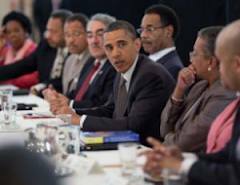 He, too, mentions the reluctance of many African American “leaders” to allow him to introduce a well thought out, executed plan of creating business; positioning ourselves to employ our own, on our own terms. Shutter the thought. So what’s the problem with some African Americans pursuing self-reliance? Why are some people in the so-called Black community so reluctant to engage in collective economy (Ujamaa) be it education, politics, business, and family? Simple. It would put some Black activists, scholars, and pundits out of work; usurping endless pontifications of detailing and delineating every injustice without a plan to eradicate it. Books sales would dip, radio shows would lose their vigor; in a nutshell, we’d have to change the game and too many people would have to find a platform that involved…real solutions. …self reliance: the not so new Black that was ALWAYS how “we” did business!